Field Master is a title given to a high-ranking Sangheili in command of ground forces. They are characterized by their gold-colored armor. Field Masters command large forces of battalion strength or greater. Unlike their human analogues, Field Masters take a much more active role in combat, charging into the battle with their troops rather than giving orders from headquarters far from the conflict. They are in charge of all warriors, as well as all armor, air support, and matériel, utilized by their army. 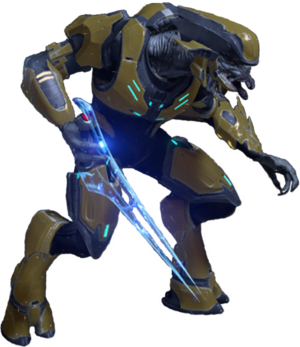 Similar to the title of Shipmaster, the position of Field Master is not limited to any particular rank, and that the post may be assumed by Sangheili of different ranks, such as Generals or Zealots. During the Battle of Draetheus V in 2554, Merg Vol's ground forces were led by a number of Field Masters. These commander's locations were well hidden by Draetheus V's unique magnetic signatures, but ultimately this did not stop SPARTAN-IV Sarah Palmer from tracking them down and killing them. Jul 'Mdama's Covenant employed Field Masters during the Battle of Installation 03. Befitting their position as senior field officers of the Covenant, Sangheili Field Masters were clad in resplendent golden armor and were equipped with extremely powerful energy shields. They were some of the most durable Sangheili units encountered by UNSC forces during the Human-Covenant War. Field Masters typically carried an energy sword, but in some instances they made use of plasma rifles. Field Masters serving in Merg Vol's Covenant during the Battle of Draetheus V often used plasma repeaters. During the Battle of Installation 03, several Field Masters serving within Jul 'Mdama's Covenant were equipped with focus rifles. A Field Master and two Sangheili Minors on Halo Installation 04 in Halo: Combat Evolved. A Field Master issuing orders to his troops while Spartan-II John-117 approaches. Re'gish Wamik, a Field Master during the Harvest Campaign in Halo Wars. A Field Master during the Fall of Reach in Halo: Reach. A Field Master in Halo: Combat Evolved Anniversary. A Spartan and Sangheili Field Master exchange focus rifle fire during the Battle of Installation 03 in Halo: Spartan Strike.